In June 2013, our collaborative George Washington University/Smithsonian Institution team–Joshua A. 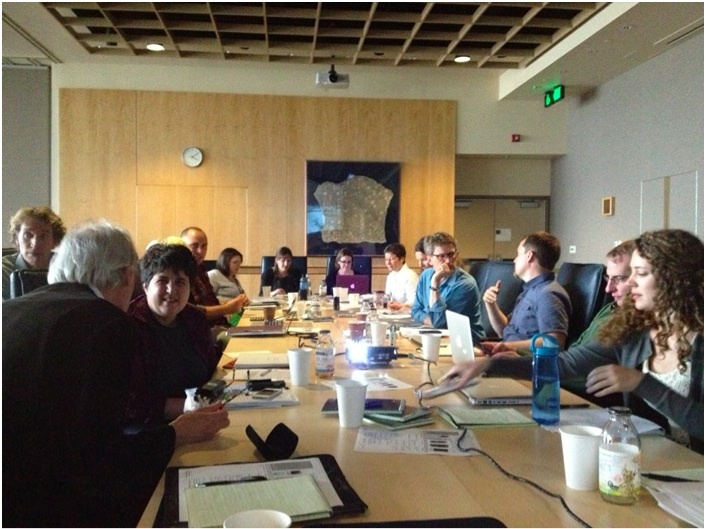 Bell (NMNH Anthropology), Joel Kuipers (GWU Anthropology), Briel Kobak, Amanda Kemble, and Jacqueline Hazen–hosted a Wenner-Gren funded workshop, Linguistic and Material Intimacies of Mobile Phones, at the Smithsonian Institution’s National Museum of Natural History. The workshop grew out of our anthropological project “Fixing Connections: The Art & Science of Repair,” which is funded by support a grant from the Smithsonian’s Consortium for World Cultures and Understanding the American Experience (www.si.edu/consortia). 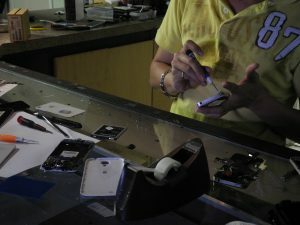 Since May 2012 we have been conducting ethnographic research in cell phone repair shops across the Washington, DC area to investigate the cultural intimacies associated with cell phones as well as their materiality. 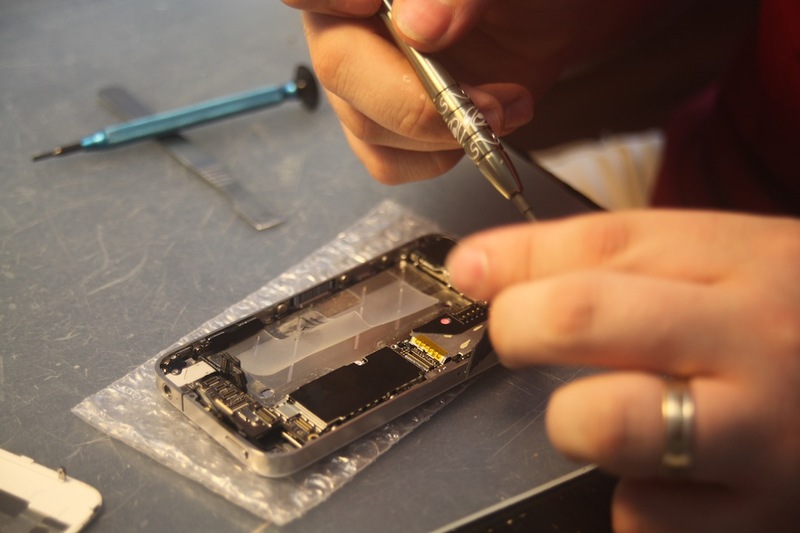 Repair shops are dynamic sites in which the social and linguistic components of technology – anxieties about damage and loss of information, connection and availability– articulate with the material realities of cell phones– the parts, supply chains, and labor that are required for repair (See Figures 1 and 2). To further explore the ways in which the social, linguistic, cultural, and material facets of cell phone use overlap and intersect, we convened a diverse group of 14 international scholars to explore the social and material implications of cell phones, from the mineral extraction necessary for their manufacturing, through their various cultural uses and adaptations, to their breakdown and repair. Ten papers were presented with Anna Tsing (UCSC) and Webb Keane (Michigan) acting as discussants. A number of themes and motifs emerged over the course of the workshop, including not only the profound ambivalence that users feel towards the technology’s affordances and drawbacks, but also the uncertainty we felt as a group of anthropologists attempting to document the use of such a ubiquitous yet highly personal device. Because of this uncertainty, we talked about cell phones through a number of seemingly opposing binaries: connections and disconnections, intimacy and anxiety, rupture and repair. To organize the contents of the workshop, we categorized the articles into three synthetic, cross-cutting themes: fetishization, inscription, and intimacy. This first dimension allowed us to examine agency, value and meaning-making along the various points of the commodity chain of a mobile phone (Appadurai 1986; Spyer 1998; Tsing 2009). Papers on this theme included explorations of the political economy of coltan in the DRC (Jeffrey Mantz, GMU), attributions of value in processes of material repair (GWU/SI Repair Collective), and anxieties over ownership and privacy in Brazil (Alexander Dent, GWU). The second analytic of inscription interrogated the cultural variation by which mobile phones structure new forms of temporal and spatial practices of users in their respective media worlds (Orr 1996; Latour 1999; Keane 2003). Papers on inscription included examinations of the re-curation of museum artifacts via Instagram (Alexandra Weilenmann & Thomas Hillman, Gothenburg) and the worlding of worlds through video sharing amongst the Yolngu in Australia (Jennifer Deger, ANU). The third thematic, intimacy, centered on the ability for these devices to construct subjective emotional experience along specific cultural dimensions (Ito et al. 2005; Horst & Miller 2006; Katsuno and Yano 2007). Participants in this grouping wrote on varying topics, such as experiences of disruption across 15 cultures, including the blind, deaf, and elderly in the US (Elizabeth Keating, UT Austin), state and familial networks on a Caribbean border (Heather Horst, RMIT University), communicative patterns among Norwegians during times of crisis (Rich Ling, IT University of Copenhagen), the management and presentation of self through social media (Ilana Gershon, IU), and the cell phone’s role in romance and the intimate economy in Mozambique (Julie Archambault, Oxford). Figure 3: Participants conversing at the workshop held in the National Museum of Natural History. Photo Credit: Rob Leopold. Read together as a special collection or edited volume, the articles presented at this workshop will bring together actor-oriented, fine-grained ethnographic data with broader anthropological theory on materiality, technology studies, linguistics, and anthropology of the self. The workshop will also provide the theoretical foundation for a planned exhibit on mobile phones tentatively titled, Unseen Connections: Natural Histories of the Mobile Phone to be held at the Smithsonian Institution’s National Museum of Natural History in Washington, DC. Horst, H. A. and D. Miller. (2006). The Cell Phone: An Anthropology of Communication. New York, NY. Berg Publishers. Ito, M., D. Okabe, M. Matsuda (Eds). (2005). Personal, Portable, Pedestrian: Mobile Phones in Japanese Life. Cambridge, MA. The MIT Press. Katsuno, H. and C. Yano. (2007). “Kaomoji and Expressivity in Japanese Chat Rooms.” In B. Danet and S.Herring (Eds. ), The Multilingual Internet (278-300). New York: Oxford University Press. Keane, W. (2003). Semiotics and the social analysis of material things. Language and Communication 23 (3-4), 409-425. Orr, J. (1996). Talking About Machines. Ithaca, NY: Cornell University Press. Spyer, P. (Ed.) (1998). Border Fetishisms: Material Objects in Unstable Places. London: Routledge. Tsing, A.(2009). Supply Chains and the Human Condition. Rethinking Marxism 21(2), 148-176.